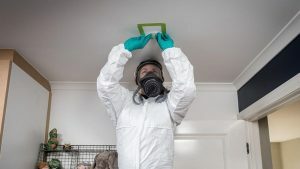 The methamphetamine scourge in Queensland is not only taking its toll in human misery, but also creating a nightmare for property owners who have to clean up after the clandestine drug manufacturing operations. It is not cheap to perform a thorough clean, as it can cost up to $30,000 to rid a property of the potentially deadly chemical residue, a task which can require the services of specialist cleaners, often equipped with protective gear and procedures to protect against the harmful chemicals. These drugs are so potent that they can still be detected after going through a thorough water treatment process. Meth. / Ice / Crack use has been an epidemic in Australia for the last 22 years. We are the highest users in the English speaking world. Meth. is a vapour (not smoke) when it settles it solidifies and locks on to a surface. Normal cleaning will not remove it and it will leach back through a painted surface. Meth residue is invisible and odourless and will last for years and years, longer than a house will survive. Australian standard for residue is 0.5 micrograms per square 100cm, this is probably 2 sessions of 1 gram each in the same location in a house. Do not think it is only in poor socio economic areas, it is everywhere! Cleaning can be done for smaller contaminations – estimate cost of a 3 bedroom house is $15,000 – $30,000, but this doesn’t include replacing floor-coverings. Note meth labs cannot be effectively cleaned, the entire property would need to be gutted. Research is showing that meth residue side effects include respiratory problems, headaches, eye and skin irritation, sleep disturbance, behavioural problems in children and can also seriously affect pregnancies, and people with ADHD and asthma. carpet, the walls, furnishings and the floor, and it is very difficult to remediate — properly decontaminating the house can require completely gutting a property to a shell. As your agents, we need to ensure you are armed with the most up-to-date knowledge to help protect your investment. So, what does this mean for the property owner? The bond paid may not cover the cost of a major clean-up. The property manager/owner’s option would be to seek compensation from the tenant by going to the Queensland Civil and Administrative Tribunal (QCAT). Should the use of Methamphetamine be a concern in your property, the most affordable way to screen a rental property is by the lab-analysed Base Composite Screen. The baseline test involves the collection and analysis of several samples, with results returned within 48 hours. Methamphetamine use in residential homes sadly, is a real issue. Of course we hope none of our owners are faced with a methamphetamine clean-up. However this is another very important reason why Landlord Insurance is vital for a property owner. Making regular screenings a part of the property management process is the most effective way to ensure both the property and tenant are safe and the landlord is protected from a massive clean up bill.